Many years ago, desktop PCs had choice and diversity that split the enthusiast market into a rivalry that become one of the most important in contemporary technological history. By 2010, Intel and AMD were at a crux regarding their corporate relationship, engineers were poached, secrets leaked, fines were paid, and some heads rolled. Despite a huge settlement in AMD's favour, Intel had bounced back from the awful Pentium D processors with the Core 2 series. AMD on the other hand had finally managed to acquire ATI and was in the midst of a full reshuffle. By the time the first Sandy Bridge CPU hand landed, AMD was (at least quietly) unsettled, and they had then begun to offer hex-core 'Thuban' Phenom II CPUs to remain competitive. This was over half a decade ago, and in the midst of selling off fabrication facilities to try and keep afloat, AMD were promising to bring to market an unknown new CPU architecture that ended up being part of a media storm of speculation and cryptic comments about how Intel should be worried. By the time the 'Bulldozer' based FX Series had landed, one could say it was akin to walking into a room where there are eight deep-fried whales. AMD later made a few improvements in the 'Piledriver' CPUs and despite having relatively strong multi-threaded performance, their presence remained purely to undercut the middle market while Intel and their Tick-Tock development process left AMD eating dirt. It was at this point AMD announced that they would retire from the High-End Desktop Market and focus more on their APUs and SoCs. This was, unfortunately, terrible for consumers due to Intel's stranglehold on the performance market. Desktop computer performance has somewhat stagnated despite headway made in storage bandwidth and graphics performance, so quad-core CPUs ended up dominating the mainstream for close to 10 years; meanwhile the 'Extreme' platform from Intel remains at a considerable premium. AMD needed a plan, and eventually word of the 'Zen' architecture started echoing around the internet. It became clear that AMD had wiped the slate clean to develop something new, a risky but necessary venture. After 4 years of development, and two million engineer hours, AMD were finally ready to announce 'Ryzen'. There will be three markets, Ryzen 7 (Prosumer/enthusiast), Ryzen 5 (High Performance) and Ryzen 3 (mainstream). Today we take a look at the flagship 'Summit Ridge' CPU, the Ryzen 7 1800X. It features 4.8 Billion transistors based on Globalfoundaries' 14nm fabrication process using FinFET '3D' Transistor technology. There are 8 'real' cores (as opposed to modules) that features SMT (Simultaneous Multi-Threading) similar to Intel's Hyperthreading, providing a total of 16 threads of computing power. 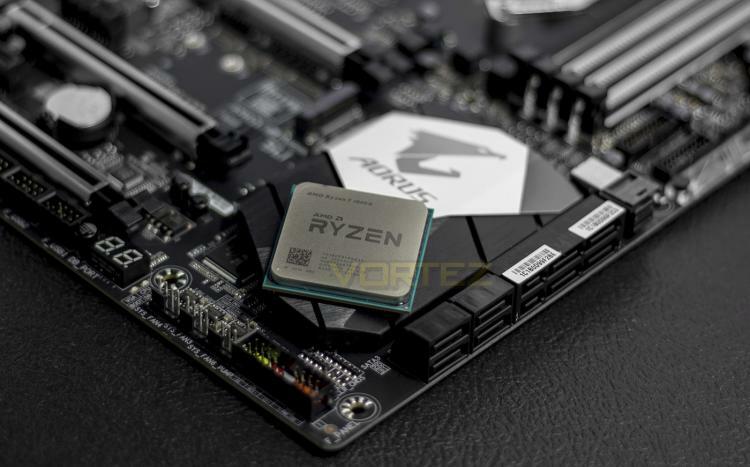 AMD claimed to have aimed to improve IPC (instructions per clock) by 40% over their previous CPUs, and latest news and press releases revealed that they have smashed that target. Now, we get to find out.